I Blog Anime: Asobi ni Iku yo: Ha?! 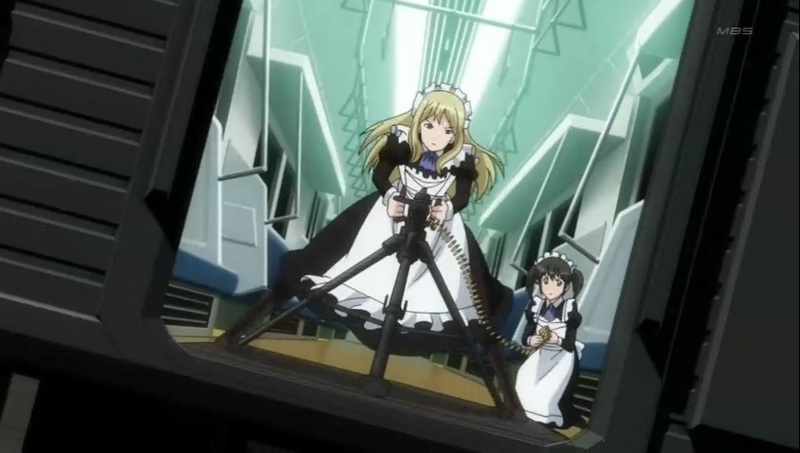 Yes, that's a maid manning a light machine gun. 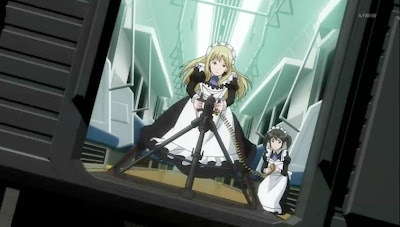 Do you know what this anime reminds me? Sengoku Basara. Not because they're similar by any means, it's the fact both anime since the beginning have made clear they are totally not taking themselves seriously. Sengoku Basara is filled with ludicrousness, but I think Asobi ni Iku yo beats it hands down. Only other anime I can think of that comes close to this level is Sora wo Kakeru Shoujo, which is one of the most ridiculous yet enjoyable anime I've ever seen. Being ludicrous does not automatically mean it's bad. If made well, they could an instant classic like like Sengoku Basara or Sora wo Kakeru Shoujo. Oh, did I tell you that this anime is actually about cats vs. dogs? I wonder how much more ridicule they could add into this story.